Photograph by Paige Cobos/The Guardian. Since Wright State students have been dealing with the effects of the faculty strike, the University Activities Board (UAB) has been busy keeping our spirits up. On Jan. 22 in the Student Union Atrium, UAB set up the Break Out Bash, hosted by Great Escape Game. The event proved quite a success with students. 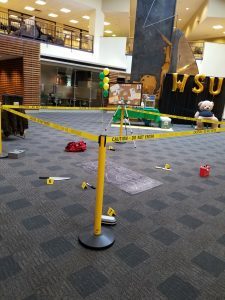 For the Tuesday event scheduled between 12-4 p.m., a group of students could pose as FBI agents investigating a mock murder scene. With just 15 minutes to solve the crime, the group had to work together to find the killer. “[The event was] meant to help keep morale up on campus. We always wanted to put on an event like this and it was a group effort with the UAB to put this on,” said Maggi Hol, director of Campus Spirit with UAB. Teamwork and collaboration have been continuous themes throughout the process of putting on this unique event. “This event took about a week to plan out and Great Escape Game has been wonderful to work with,” Hol said. Great Escape Game is a local game room located in Beavercreek that offers a variety of different escape rooms, such as a cursed tomb and virus outbreak, with different levels of difficulty. Kara Weaver, a Wright State student and Great Escape Game employee, managed the event and was pleased by the high turnout and positive feedback from students. During such troubling times on campus, a little wholesome fun went a long way.